Does anyone remember when books were infectious? Carrying on from my last post, I started replying to the comments but went galloping off down so many side alleys I thought I'd just post and have done with it. I won't take my Penguin classic with me, though if I did, I'm sure I could find reasons for its sudden and tragic disappearance, preventing me reviewing it. The main one, I think, is its potential as a source of infection. Oops! There it goes - drowned under a pool of antiseptic hand wash.
Every now and then I get elderly library books in stock, with a list of firm instructions in the front (none of this openness, let the toddlers drool on the books stuff here) in which you are firmly told not to turn down page corners, mark the books and that you MUST let the library staff know if the book has been in contact with anyone who has an infectious disease. I'm trying frantically to get my desk (and my mind) clear before Thursday 24th, as I am then, in theory, due to go into hospital to have my nose mended. I am only in overnight (again in theory) but I have a dilemma - what do I take in to read? I am halfway through Rosy Thornton's Hearts and Minds, for which many thanks to Juliet. I am thoroughly enjoying this portrait of the poisonous politicking of student and staff, but I fear I will have finished it before Thursday, and I know I don't have the discipline to leave the book alone now I've got my teeth into it. On my bedside table is the very unfinished The Blair Years, which is not quite the thing when you are on your bed of pain and want your mind taken off life, rather than being so irritated you burst your stitches. I keep picking this up, reading a few pages and then putting it down again, so desperate with the longing to give all the major characters a sharp slap that I can go no further. Well done daughter - you made it! It's such a marvellous title, isn't it? The Dream Pony of Doooooooom. I could not resist the title, and so, along with a load of other things it made its way across the Atlantic to me via Book Closeouts (though that said, it is actually a British book). 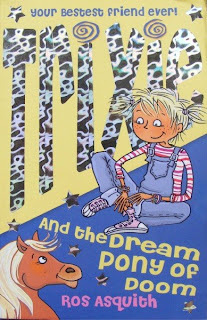 I had a lot of fun before the book arrived conjuring up scenarios for The Dream Pony of Doom. Was it a Connemara fresh from Ireland, with a liking for the mystical? Or a sadly clumsy Shetland? Or maybe a literate pony convinced it was the next Cassandra? Well no, and no, and no. Marks & Spencer has been in Kettering for as long as I can remember, and it's never changed much. Apart from the knicker department, I usually walk on, on, on through the clothes part. The colours are over-bright, the styles look dire on the mannequins - and they're thin, so what on earth will they look like on me? - and nothing looks as if it much wants to be put with anything else. It's been a shamefully long time since I did a review. My fellow reviewer will not be contributing to this. I made the fatal mistake of buying her the first two Georgia Nicholson books, and so all hope was lost as far as horsey book reviewing went. Added to that, she is now off in Germany on her school trip, wildly excited as this is the first time she has been Abroad. She was so full of whoomph she managed to get up effortlessly at 3.00 am on Wednesday so we could get to Kettering in time for the 4.15 am start. Although I am definitely a lark, and usually wake at 5.00 am at this time of year, 3.00 am was pushing it a little, particularly as I didn't sleep well, being too petrified of oversleeping and missing the off..... despite having own mobile, son's and husband's all set for a 3.00 am alarm call. Manners maketh the Pony Club. Or not. I get asked to donate prizes and vouchers to various horsey organisations and I'm generally pretty happy to oblige. Recently, a certain branch of the Pony Club (who shall remain nameless, but they are not local to me) and Equine Market Watch asked me for prizes. So, always wanting to encourage the younger entry, and having a lot of time for EMW, I wrote off to both saying yes, of course I would help. Had a lovely message from EMW. Nothing from the Pony Club. The message from EMW was so kind, I in fact sent them two books rather than the one I'd originally promised, for which I had a lovely thank you letter, and they've been nothing but kind and helpful ever since. She was saving herself for this epic effort on the left. 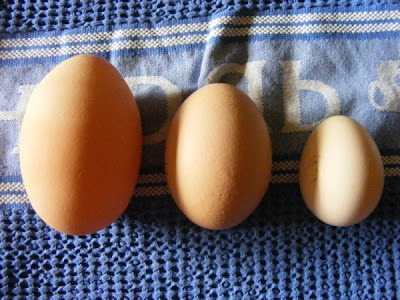 In the middle is one of her normal eggs, and to the right is one of the bantam's. Fortunately she seems none the worse for the experience, and shot out of the stable as enthusiastically as normal to tuck into the remains of son's lunch. Ouch. The lavender's beautiful, but there are no bees. A bit flattened from all the rain, but valiantly flowering on. 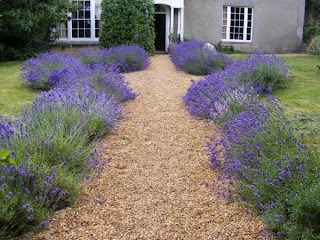 I think if I had my time again I'd go for a less purple and more, yes, lavender shade, but I love the hedge anyway. One thing I have noticed this year is the dreadful decrease in the number of bees on the lavender. Usually when I walk down the path I am surrounded by them. There must be less than half the usual amount this year. Whether it's varroa mite, colony collapse disorder, our love of the mobile phone or something else, we need our bees. I have many of the plants that bees love: comfrey by the yard, rosemary, groves of foxgloves and of course the lavender, and if I haven't got bees, then who on earth has? 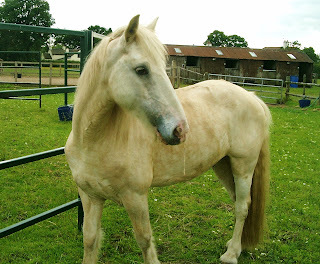 The Equine Market Watch charity has three sanctuaries in Powys, Herefordshire and Shropshire. It campaigns on issues of horse welfare, against indiscriminate breeding, and takes equines in need into sanctuaries to rehabilitate them and place them in approved loan homes. As a policy they don’t buy from markets unless it is clear that there is a pony who is so distressed it cannot in all conscience be left there. Most of EMW's residents are signed over due to their owners' inability to cope, for a variety of reasons. The charity’s motto is “We will NEVER look away”. The picture shows Louis, rescued from an abusive home. You can meet him at the Open Day. Well, BAFAB (Buy a Friend a Book) week is nearly over, and you can tell I'm playing catch-up. So, my offerings are sparkling new copies of Joanna Cannan's We Met Our Cousins, and Monica Edwards' No Entry. To win one, you will need to add a comment to this blog entry. 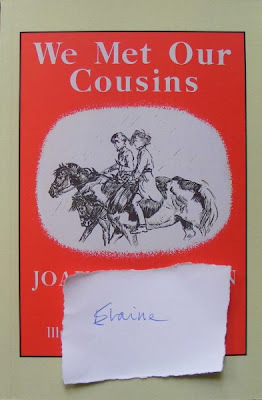 The Joannan Cannan is one of her earliest children's stories, and involves a prim London brother and sister clashing head on with their Highland cousins, who scorn shoes and prissiness. It's told with detachment and humour, and reflects Joanna Cannan's Highland holidays escaping from the Oxford academia that governed her own childhood. Apologies to everyone who's been visiting the blog and wondered about my silence. Life has been even more manic than usual, so blogging, along with many other things has had to take a back seat. Instead, time has been eaten by visits to the hospital for me and daugher - who is now, hurrah! hurrah! out of her cast. The nurse asked her if she wanted to keep it. She is only too glad, I think, to get rid of it, especially now there was no more room to draw on it and it was therefore of no interest at all. The consultant told her firmly to avoid PE and all contact sport for another 3 weeks. We both nodded wisely, knowing full well that she has her Modern dance exam this Sunday, and no intention whatsoever of not doing it.